If you have read one of my blog posts that describes a private hire duty at Crosville and thought to yourself “I could do that”, now’s your chance. Since taking on the job of allocating drivers for upcoming driving duties I’ve realised that a bigger team of part time drivers is needed so I’m looking for suitable drivers to join the team. When I say ‘suitable’, I mean that you’ll need to already hold a full Category D (PCV) driving licence and hold a current DCPC card. Although I can offer familiarisation sessions with our buses, you will need to be already competent with a crash gearbox vehicle. Sadly we don’t have the resources to teach double de-clutch technique from scratch. We’re based in Weston-super-Mare, Somerset so you will need to live within reasonably easy reach of our depot. We don’t send our buses on long distances as this is quite tedious for the drivers and adds to the wear and tear of the vehicles unnecessarily. As you will know if you’ve read my posts, driving for Crosville is very rewarding. Taking passengers to a wedding or on a special outing is great fun and I get a lot of pleasure in helping them to have a good day. One of the best bits of course is that you get to drive some wonderful old buses, particularly if you like Bristols. Although they can be challenging at times, the feeling of accomplishment at the end of the day is immense. The standard of our heritage fleet is high and is improving all the time. For example, one of our ‘workhorse’ Lodekkas is away at the moment having a thorough refurbishment. Southern Vectis 573 (Bristol FS6G YDL318) has already had its Gardner engine rebuilt and it will come back into service looking just like new. That includes new window rubbers and period adverts. So, if you (or someone you know) would like to join the team, please leave a comment and I’ll reply to you privately. 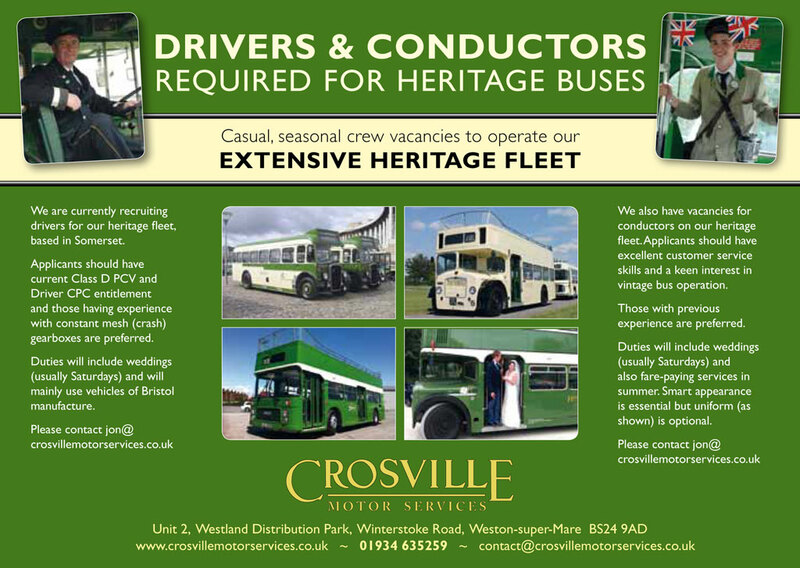 There are some seasonal heritage crew jobs being advertised at the moment by Crosville Motor Services. They need to recruit additional drivers for their private hire bookings which, if you are a regular reader of this blog, is the main reason for my own involvement with this firm. As you know I drive for them occasionally and, if last year is anything to go by, there were heritage buses going out virtually every Saturday from March until December. On several summer Saturdays there were four out at a time! If you are a driver with a clean Category D PCV licence and current Driver CPC entitlement, call Crosville on 01934 635259 or email contact@crosvillemotorservices.co.uk. If you have an interest in older vehicles that would be great. If you are experienced with a crash gearbox be careful – they might bite your hand off! If you’re not, don’t worry as training may be given to suitable candidates. They are looking for conductors as well, mainly for private hire jobs (weddings mostly) but also for timetabled services in the tourist season. They often use Bristol Lodekkas on a couple of their routes around W-S-M so conductors will need to be able to take fares as well as run the platform. Just like the old days, really! Ticket machines will be provided but if you have your own Setright, even better. Conductors weren’t used very much on wedding duties last year but they are likely to be needed more often this year because they will be included (or offered, at least) as part of the wedding ‘package’ by Crosville. The work is not difficult if you know what you’re doing and it’s great fun too. If you’re like me, it’s like being paid to enjoy your hobby! Form an orderly queue, please.